uring the late 1950's and 1960's the British Parker factory in Newhaven, UK several models and versions of the new Duofolds were produced, aimed at the lower priced market. They were made from the injection molded polystyrene fabrication method that made way for the success of the Parker "45" in which the entire pen could be made up from the same dyes. 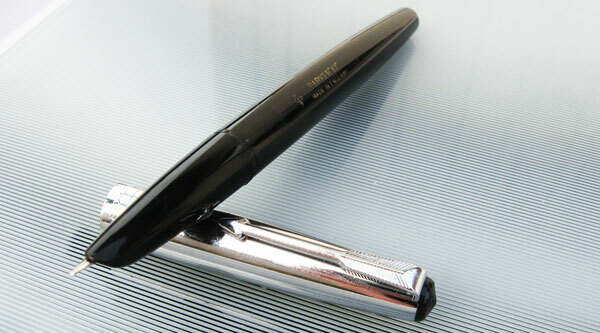 The Parker "17" all had a version of the aerometric filler, introduced with the new Parker "51" line of the late 1940's. The filler system proved to be reliable and easy to use and really had no competition until the launching of the Parker "45" and the cartridge filler system, frequently used to this day. he Parker "17" was introduced in 1962 in two designs, the Parker "17" Duofold and the Parker "17" Super Duofold (ca 137 mm, closed). The former with a thin cap ring and the latter with an unusually wide cap band and a tassie ring/jewel. Both had a slip-on cap, as opposed to the rest of the European Duofold line of the 1960's. They also sported a new style clip with more tapered feathers. The early models also had an open, beak-shaped 14k gold nib. The ends being wider and more pointed than later models, not unlike the Danish Parker Popular of the 1950's.They were offered in the four standard Duofold colours of the time, Black, Blue, Red and Green. These pens also sported metal cap grip-rings on the body. Twist-operated pencils were also offered. n 1964 the open nibs were replaced with a design sporting a more hooded nib. They were not tubular in the manner of the Parker "51's", but still hidden under a plastic lip. The same year a ladies version, the Parker "17" Lady, was launched, of the same design and colours as the standard Parker "17" but smaller in size. 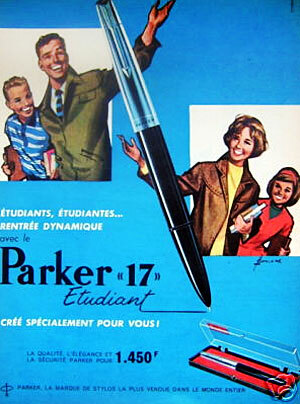 There doesn't seem to exist any examples of a ladies version of the Parker "17" Super. In 1967 a new model called the Lady Insignia was introduced that had a 12 k rolled gold barrel and cap in rolled gold, while the gripping section was in black plastic. It also sported a clip very similar to the clip of the Parker "45". In 1968 the Lady Standard (ca 134 mm) was announced, similar to the Parker "17" Lady, but sporting a longer section and the Parker "45" clip and the cap ring was situated on the cap lip. It was also a bit longer and more tapered at both ends, again Parker "45" features. custom versions, with 12k rolled gold caps and trim, also exists. The cap grip rings were now made out of black plastic as opposed of the ealier metal ones. oth the Lady Insignia and Lady Standard belonged to the Parker "17" family but were not imprinted as such. New old stock pens reveal that they had the name in white crayon on the body, but this seldom remains on used pens. A green set Parker "17" Super Duofold, 1964.
later addition to the line was also the Parker "17" Deluxe, a model with a metal cap and either chrome or gold filled trim. The GF-pens also had gold nibs, while the CT-pens had cheaper steel nibs. Interestingly enough the at least the CT-version was produced i France and the parts, save the nibs, can not be interchanged. Possibly becuse of the use of the metric system during manufacturing. he Parker "17" was discontinued in 1972 but Parker continued to sell from it's large overstock for a few years. A blue and a red Parker "17" Lady from 1964. A black Parker "17" DeLuxe. Image © and courtesy of John Gilks. A DeLuxe that was found with a Parker "51" MKIII style cap. The later DeLuxe "17" is identical to the Parker "51" MKIII, save the imprint.